-Film: Yasuni - Two Seconds of Life - ARTE AMAZONIA provides a global voice through art for the indigenous cultures of the Amazon. planet's future in the post-fossile era. This special event is to raise awareness of the cultures of the Amazon. Please join us to experience all of it's treasures! 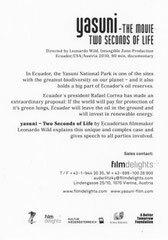 US Premiere - 24 March, ENVIRONMENTAL FILMFESTIVAL, Washington DC- Don´t miss it! FUNDRAISING PREMIERE: Sunday on March 13th @ Filmcasino in Vienna, Austria. Join us for a preview and discussion of the film with members of the film crew, the Embassador from Ecuador and Ulrike Lunacek, Member of the European Parliament and the European Green Party. 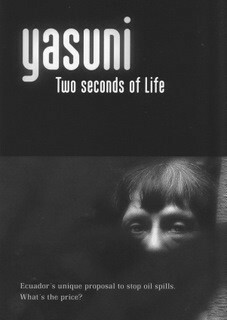 Berlin Marketscreening YASUNI - Two seconds of life, Monday 14, 2.15 pm, MGB Cinema (Martin Gropius Bau). Its the only screening, save the date! Release in Austria: 29 April, various cinemas! 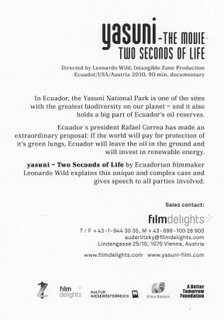 Details about the film and Yasuni.